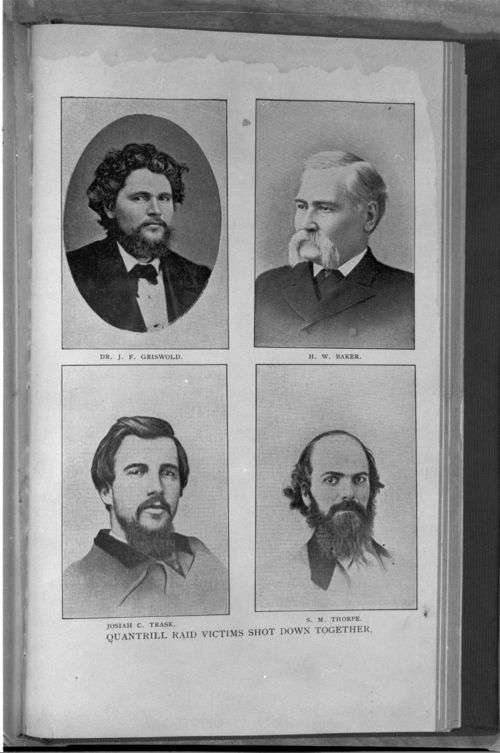 A composite of portraits showing Dr. J. F. Griswold, Harlow W. Baker, Josiah Trask, and Simeon Montgomery Thorp. These men were victims of Quantrill's raid in Lawrence, Kansas. It was copied from A History of Lawrence, Kansas, by Richard Cordley who himself experienced and survived Quantrill's raid. This collection of portraits from Richard Cordley's A History of Lawrence Kansas, helps students appreciate the human toll of Quantrill's raid on Lawrence. In addition, these portraits can be used in conjunction with Cordley's experiences during the attack on Lawrence to further emphasize the physical and psychological impact of Quantrill's attack.